JoJo's Bizarre Adventure! Either you love it, or you've never seen it. But what exactly is JoJo? Why is everyone talking about it? Why is it so great? 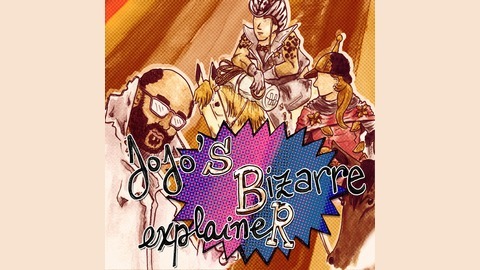 Whether this is your first foray into Hirohiko Araki's decades-spanning masterpiece, or you're a seasoned JoJo Opinion Haver looking for more of your kind, JoJo's Bizarre Explainer is here for you! Hosted by Elizabeth Simins, Courtney Stanton, and Darius Kazemi, this podcast will tease out the running motifs, fascinating weirdnesses, occasional dog deaths, and ineffable charm of JoJo's Bizarre Adventure—anime-episode by anime-episode, with stops along the way for the manga, the videogames, and whatever else we can get our hands on. 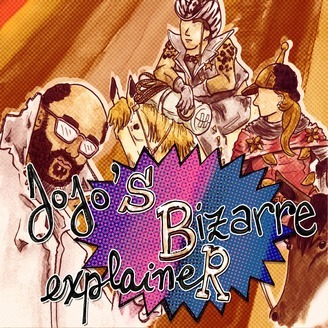 Join us as we attempt to do the impossible: Explain JoJo! The episode features the strange anomaly of a *cat* death...but it's okay because it grows into the best houseplant anyone could ever ask for. We all learn how photosynthesis works (for cats who have reincarnated into plants). Kira's personal branding and cross-promotional merchanise is extremely good. It turns out Eliz has another highly specific body anxiety that is depicted in this episode. Joseph Joestar's life is incredibly bleak when you take it all in at once. And it turns out Kira decided to hide out in the only family in Morioh with someone even creepier than him. Here’s where to find the gang on the internet!